How can you have a productive conversation about climate change, when the issue is so political? This segment focuses on how to encourage a productive conversation about climate change. KBCS Reporter, Angie Voyles Askham spoke with Joy DeLyria, Science Interpretation Program Supervisor at Seattle’s Pacific Science Center, about how to start a conversation on climate change. 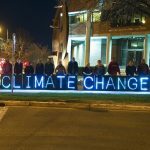 DeLyria hosted two workshops this year called “Communicating Climate Change,” all about how to have these scientifically-challenging, politically-fraught conversations in a productive way.